The numbers are promising but right now there are still thousands of cats and dogs in shelters waiting for their forever home. 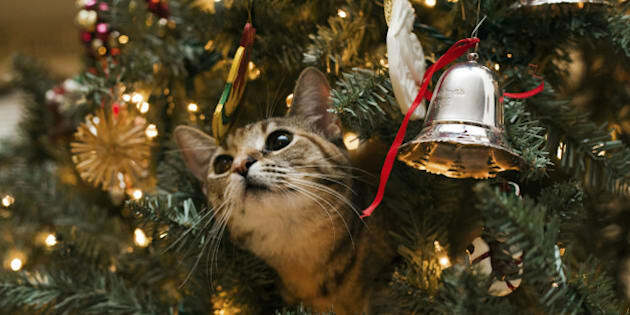 The holidays can be a magical time of year to add a companion animal to your household. Many families choose to adopt a pet and give them a home during the holiday season, creating lifelong bonds and unforgettable memories -- all while saving a life! Have you noticed lately that cats are everywhere? One moment they're cuddling with hockey players, the next they're starring in their own Christmas movie, and what would the internet be without cat videos? Is it possible that all of this attention focused on felines could be improving their welfare? This week the Canadian Federation of Humane Societies (CFHS) released our annual shelter statistics and we found that feline adoption rates have increased, euthanasia rates have decreased and fewer cats were taken in by shelters. The 2013 data was collected from 90 shelters across Canada, representing the best information about companion animals in Canadian shelters. These trends may or may not be linked to cats videos, but it does seem that people are starting to care more deeply about cats. Two decades ago in 1993, when the CFHS first began systematically collecting shelter statistics, only 28 per cent of cats entering shelters were adopted. It's a number that is hard to imagine. In 1993 a staggering 60 per cent of shelter cats were euthanized. For dogs 39 per cent were adopted in 1993 and 30 per cent were euthanized. Fast forward to the most recent shelter statistics from 2013 and you'll see that things have improved. The adoption rate for cats has increased to 53 per cent and the euthanasia rate has dropped to 37 per cent. For dogs the 2013 rates are 49 per cent adopted and 17 per cent euthanized. The numbers are promising but right now there are still thousands of cats and dogs in shelters waiting for their forever home. The holidays can be a magical time of year to add a companion animal to your household. Many families choose to adopt a pet and give them a home during the holiday season, creating lifelong bonds and unforgettable memories -- all while saving a life! And what's more -- choosing adoption helps improve our communities! SPCAs and humane societies are more than just adoption centres, they also provide humane education, care for animals in need, and enforcement services, all of which make our communities stronger and more humane. Need more convincing? Many of the internet's most famous cats were adopted from shelters. Lil Bub, Henri le Chat Noir, Colonel Meow and Hamilton the hipster cat are all former shelter residents. Their adoptive owners saw their star power and let them shine in a loving home! Have a wonderful holiday season with family, both four-legged and human. Let's make 2015 the year shelters are empty! Read the CFHS shelter statistics report here. An age-old battle. At least in Russia. There are cat burglars... and there's this guy. Turns out not everyone's a fan of 'Frozen'. Roomba Cat really pulled out all the stops for Halloween 2014. The tale of David and Goliath, reworked for 2014 (and YouTube). It all starts off so sweetly... but the shocking truth will out. And things unsurprisingly don't go well. Because not all cat jumps end badly. And reacts in the most cat-like way possible. No, we have no idea why Momotaro does this, either. Milo wanted attention. Milo got it. A truly touching way to end the round-up.